Natural unrefined whole crystal salt, free from artificial additives or anti-caking agents. Fine granulated Himalayan salt for cooking and table use. Benefits of Himalayan salt include the remineralisation of the body with over 80 minerals and trace elements essential to health. It also helps to balance the body's pH levels, and can lead to significant positive changes to respiratory, circulatory and nervous system functions amongst others. Perfect for making Sole, the synergistic combination of water and salt that has a higher energetic vibration than either water or salt alone. Fine Himalayan Crystal Salt. 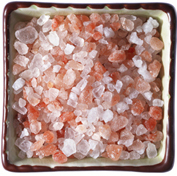 Natural unrefined whole Himalayan crystal salt, free from artificial additives or anti-caking agents. This bag is re-sealable and easy enough to store. Granulated Himalayan Crystal Salt. Natural unrefined whole Himalayan crystal salt, free from artificial additives or anti-caking agents. This bag is re-sealable and easy enough to store.